Is Swaddling in the Summer Heat Dangerous For Your Baby? Whoever thought wrapping your baby in a cloth could help them settle down and sleep soundly? Mothers throughout history, it turns out! Swaddling, the practice of wrapping a baby tightly in a blanket or wrap so the limbs are restricted, is centuries old and remains popular today. Swaddled babies sleep sounder, scratch their faces less, and learn how to self-soothe. However, some parents have concerns. Is it safe to swaddle your baby in the summer heat? What can you do to enjoy the benefits of swaddling without overheating your baby? 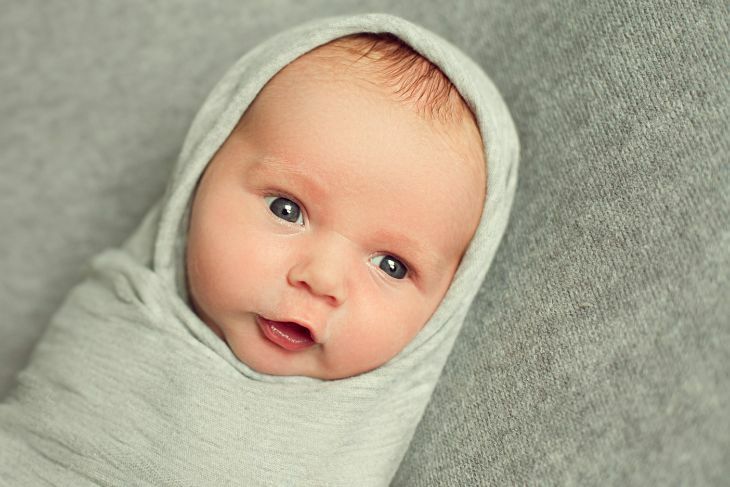 We took a closer look at swaddling during those sweltering summer months to find the answer. Babies are not able to regulate their body temperature. They cannot shiver when they are cold and they are unable to remove layers of warmth, such as clothing and blankets, when they get hot (source). That is why you must constantly monitor a host of factors to ensure your baby is comfortable and safe. Your baby’s natural temperature range. The temperature of your baby’s environment. How many clothing layers your baby is wearing. What sort of fabric the clothes are made of. If you keep these factors in mind, you will be able to swaddle your baby safely during the hottest months of the year. Read through these six essential tips and learn to swaddle your baby with confidence and peace of mind as the weather gets warmer. Not every swaddling blanket is created equal. During the summer, choose a wrap made of 100 percent cotton. Cotton is light and breathable. Muslin is a form of cotton that is also very popular for summertime swaddling. Avoid synthetic fabrics and any wraps with a lining. You can even find special wraps designed to make swaddling trouble-free. Instead of a large blanket wrapped around your baby in a certain pattern, these wraps feature easy-to-use pouches and zippers. When you swaddle your baby, what do they wear? What are their clothes made out of? In the summer, make sure your baby’s clothing is light. They should not need more than one layer of clothes. You can even swaddle your baby when they are only wearing a diaper. When swaddling in the summer, it is also important to make sure your baby’s head isn’t covered by a hat or by the swaddling wrap itself. Heat escapes through the head and keeping it uncovered will help your baby stay cool. Your baby isn’t the only thing with the potential to overheat in the summer. Your house, car, and stroller can all become sweltering hot. It is especially important to monitor the temperature in your baby’s room — babies are most often swaddled when they are put to sleep in their crib. The ideal temperature for your baby’s room is between 65 and 70 degrees Fahrenheit (source). Use a digital thermometer or a baby monitor with a thermometer to keep track of how hot your baby’s room becomes. To keep the room cool in the summer, consider drawing the blinds or curtains during the day and keeping the lights off. You can also use a fan, placed safely away from where your baby could reach it. Make sure to store fans away when your baby is mobile in any way. Many different swaddling techniques exist, based on what your baby needs and preferences on how you like to wrap the blanket. Here are two different swaddling techniques that are particularly useful during the summer. First, is a technique allowing part of your baby’s body to remain uncovered. This keeps your baby cool and allows their limbs access to the cool air around them provided by a fan or air conditioner. However, it also keeps the blanket tight and secure on the upper body, which will prevent your baby from kicking off the blanket. The second technique is known as the arms only swaddle (source). It is ideal for older or larger babies who have trouble sleeping because their arm movements startle them awake. Use a baby safe powder to absorb sweat and prevent rashes. In the summer, there is a higher chance of your baby becoming toasty and warm. Friction and sweat can lead to rashes, especially at your baby’s joints. Apply the powder to cool, dry skin before swaddling your baby. Be sure to put the powder on your hands first. You have to use caution when applying powder — even baby powder — to a baby because it can hurt their lungs when inhaled (source). Your first thought on how to keep your baby cool when swaddling may be to wrap your baby loosely in the swaddling blanket. This can be very dangerous. Should your baby be wrapped too loosely, they could kick off the blanket or wrap. Loose items in the crib, including blankets, can increase your baby’s risk of Sudden Infant Death Syndrome. If the blanket ends up over your baby’s face or becomes constricted around their neck, it can lead to a scary, and potentially fatal, situation. Always make sure you swaddle your baby tightly. If you are concerned about how to swaddle correctly, talk to your pediatrician. Nurses and doctors can instruct you in safe techniques. You can also reach out to trained midwives and doulas. The easiest way to ensure you swaddle your baby safely during the summer is to monitor your baby’s temperature and watch for signs of overheating. Hot skin: Feel your baby’s ears and cheeks. If they are hot to the touch and red, your baby may be overheated. Sweat: If your baby is sweating at all, they are too warm. If you are concerned they may have gotten too warm, unswaddle them to see. Rapid breathing: Check to see how fast your baby’s breathing is. Fast, shallow breathing is a sign of overheating. Room temperature: Your baby could be too hot if they are swaddled and the room is hotter than 70 degrees Fahrenheit. Trust your instincts! When in doubt, don’t hesitate to unswaddle your baby and check on them. If your baby has become overheated, remain calm. Remove your baby from the swaddle. If needed, remove their clothing. Carefully fan your baby or rock them away from your body next to an electric fan. Using a soft washcloth, gently apply lukewarm water — not cold — directly to their skin. If your baby seems extremely hot or if they may have been hot for quite some time, give them a rehydration fluid such as Pedialyte (source). If your baby vomits or loses consciousness due to heat, call emergency services or travel to the hospital right away. These signs could signal heatstroke and your baby needs to be assessed right away. Swaddling is a lifesaver for many moms, and you can enjoy the benefits of swaddling no matter the weather by following proper techniques and safety practices. Are there moms out there who have swaddled their babies during the summer? Share your tips and tricks in the comments below. We would love to hear your real-life experiences and we know they will be beneficial to all the moms who had the same questions you did. Please consider sharing this article to spread the word about this important topic.